Fastpath: Admin > Settings > Tickets. When you enable the CC setting, agents can copy users in ticket email replies or in the ticket view Zendesk Support. Additionally, depending on the permissions you set, signed-in end-users might be able to copy users in ticket email replies and in Help Center. CC recipients receive copies of a notification email when the ticket is created, and then every time somebody adds a public comment to the ticket. The CC recipients can also add comments to the ticket conversation. You can CC a maximum of 20 end-users in emails to prevent spam scenarios. However, you can CC an unlimited number of agents. Only agents can delete CC recipients. Agent recipients receive all updates. End-user recipients only receive public updates. When copying unknown end-users through email, new users are created automatically if your Zendesk doesn't require users to register. If you have a closed or restricted Zendesk, agents and administrators can CC unknown or unregistered email addresses. Those addresses will receive email when the ticket is updated, and can add comments to the ticket via email, but may not be able to access the ticket through Zendesk. End-users cannot add unknown CCs. Any additional people listed on the "To" line of the email are added as CC recipients on the ticket. There is no BCC option. Users should expect others to see the message. You can give agents and signed-in end-users permission to copy (CC) people on tickets or you can restrict adding CCs to agents only. Note: If you're using a Zendesk trial account, you cannot enable CCs for end-users. When you enable the CC setting for agents, agents can copy users in ticket email replies or in the ticket view in Zendesk Support. If you enable end-users to add CCs, signed-in end-users can copy users in ticket email replies only or in ticket email replies and in Help Center. If you disable the Anyone can submit tickets option, you will not be able to add CCs in Help Center and end-users will not be able to CC people outside of your Zendesk account. See Enabling anyone to submit tickets in Zendesk Support. Note: CCs act as a system field, so you cannot manipulate CC email notifications with triggers and automations. If the CC field is active, end users will always be emailed public ticket updates. CCs must be enabled to merge tickets from different requesters. To let agents and signed-in end-users add CCs to tickets, select Enable CCs on Tickets. When selected, agents can copy users in ticket email replies or in Zendesk Support, and signed-in end-users can copy users in ticket email replies. Note: If you disable CCs on tickets, you will not be able to change the requester on existing tickets. You can limit CCs to agents only or add the ability for signed-in end-users to add CCs in Help Center using the settings below. To prevent end-users from adding CCs, select Only Agents Can Add CCs. When selected, only agents can copy users. End-users will not be able to copy users in ticket email replies or in Help Center. If you did not limit adding CCs to agents only, you can select Enable CCs for End-users on Help Center to enable signed-in end-users to copy users in Help Center. Note: If you have a custom Help Center theme that was customized before December 14th, 2015, you might need to also add code to your theme for the CC option in Help Center. To specify email addresses that should never be copied, add them to the CC Blacklist. Use spaces to separate the addresses. Save your changes by clicking Save Tab. If an unknown user, who was not added to the ticket by the requester or an agent as a CC, updates an existing ticket, the comment is flagged and added to the comment stream as a private note. Most likely the email was forwarded by the requester to an unknown user or to an unverified email account (such as a secondary email address), and then replied to. If you want to allow the new user to comment publicly on the ticket, an agent, the requester, or a CC on the ticket needs to add them as a CC. Note: If you continue to see flagged comments by the same user, and you think that person might be trying to gain unauthorized access to Zendesk Support, please contact the Zendesk Support Team. You can modify the subject and body of the email that is sent to CC recipients see when they are CC'ed on a ticket. Edit the CC email text. Edit the CC email subject field to change the subject that appears in CC email notifications. Edit the CC email text field to change the body that appears in CC email notifications. You can add email addresses or domains to the CC blacklist to prevent them from being copied on tickets. Enter email addresses or domains separated by spaces in the CC blacklist field. Is it possible for Light Agents who were CC'ed by an agent to receive notification when a private comment is added? Or would we have to tell them to check their account externally? When a Light Agent is CC'ed on a ticket they will get an email notification anytime a comment is added, whether it's public or private. Could you explain why "CC recipients receive copies of a notification email when the ticket is created", even if the ticket was created via an email channel? The CCs are added to the ticket precisely because they received a copy of the email in the first place. So we have the situation where people receive the original email from someone, the ticket is created in Zendesk, they are added as CCs and then get an automatic copy of it sent by our Zendesk. This leads to much confusion and quite a bit of grumbling. This behavior is really useful in certain workflows, such as when an agent is creating a ticket on the end-user's behalf. If the agent adds a CC before creating the ticket, they will stay in the loop from the start. Unfortunately in your case, there aren't many viable workarounds. If most of the tickets in question are agent-created, they could always remove the CCs in the email, forward into Zendesk, and then re-add them in the ticket. Other than that, I would suggest contributing to our Product Feedback topic about this limitation. 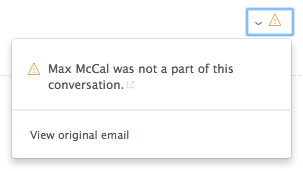 Is there any way to control the "User was not part of this conversation"? Our current set-up is that we assign a ticket to a group, which only contains light agents, who then respond to the e-mail they get when the ticket is assigned to their group. However, the comment shows up with the warning that the user was not part of this conversation. If a light agent comments on a ticket assigned to a group of which the light agent is a part of, shouldn't the light agent be considered a part of the conversation? I love the new feature that allows you to " Enable CCs for End-users on Help Center." It's been something that our users have been asking us for a long time. Unfortunately, we can't use it. The part that does not work for us is that if users are not in our account they will automatically be added if they were CC'd on a request. We need to approve all accounts that are created in our Support site so having users have the ability create user accounts just doesn't work for us at this time. It was a total bummer. It would be great if there was an option for us to approve the creation of accounts if cc's were added. I'm guessing this would add too much complexity to this..but I can dream, right? Trying to remove "brand" from ticket subjects in CC emails, and can't find "Settings > Tickets" in my Zendesk. Did I miss it? You should be able to just click on the Gear Icon in the lower left corner of your Zendesk, which will display all your Admin options in a drawer on the left side of your screen. Scroll to the bottom of that list and the very last section is Settings. You'll find the Tickets option you're looking for there. If you don't see that section, you most likely don't have the necessary role in your Zendesk. You'll need to talk to an admin to get that taken care of. Thank you Jessie, that did it! "Only agents can add CCs" is selected on our "Settings / Ticket" section. We have a user who was added to a ticket as a requester (or CC). Then afer a while his boss asked us to remove him from the conversation(ticket). And so we removed him from CC or changed the requester if he's the one requested. Now, whenever he email to that ticket, his email is accepted automatically and he joins back to the ticket like a BCC... I mean, I can't see him on CC, nor in Requester section. But his mail gets in and gets forwarded to anybody in the ticket. BTW, this started to happen when we started to use new Zendesk. Everything was normal in classic zendesk version. Like, when he was mailing back after he was dropped from CC & Requester sections, his email was automatically going to the "suspended" section. What you're experiencing is expected behavior. We were having issues where emails that should have been added to an existing ticket were creating new tickets instead, and it was causing a lot of headaches. To address this, we changed what Zendesk looks at in an incoming email to get it routed correctly. When the user that was removed from the ticket responds to a notification that he received before he was removed, Zendesk will send the comment to that ticket. This is normal. However, because you're set up so only agents can add CC's, his email does NOT re-add him to the ticket, so he is NOT receiving any new ticket notifications. The only way to prevent him from continuing to comment on the ticket would be to suspend his user profile. Suspension doesn't have to be forever, so you can un-suspend him later, but it would prevent him from creating new tickets or participating in other open tickets he might be a part of for the duration of the suspension. I now understand why system act like that and it might sure be causing headaches. But what we are having here is one another real headache too :) Hope Zendesk soon adds one further level option there, to not accept any more messages to the ticket from removed requesters/CCs. Is there a way to block suspended users from being added as CC on a ticket ? I have many users that I don't want to delete, but I don't want our agent's to be presented the suspend user when they add someone to CC. The reason is that we have fx. "Jimmy A" and "Jimmy B". Jimmy A is suspended but still show up when typing in Jimmy and then the agent only want to se Jimmy B, since he is the only one who is active. But sometime the agent's don't notice this and then choose Jimmy A instead of Jimmy B. Hope there is a way to solve this. Yes I have tried the CC blacklist function, but it doesn't seem to work. Because no matter what email address I put in that field, I can still select the person/email in the CC field. The blacklist function doesn't prevent the email address from being added to the field. However, once you submit the ticket the blacklisted CC will be removed from the ticket immediately, and they will receive no notifications. I tested this in my own instance to confirm that it's working as expected...not only was the blacklisted CC removed from the ticket, the event log didn't show that I'd tried to add them. As long as the end-users are in your Zendesk, they'll show up as an option to add to the CC field; the only way to prevent that is to remove them from your Zendesk completely. But as long as they're on your CC blacklist they can't be added to a ticket, even if your agents try. @Stephen Pryke: It's unfortunate that was considered a bug, with the way the CC notifications are handled (meaning system generated only, not available as a notification via trigger/automation) that "fix" actually made them less useful in some situations. If an end user emails our support channel and CC's someone else that's an external end-user, that person absolutely sees that initial email. But they don't see the response from ZD telling them that a ticket was created along with the ticket ID. Any response they make is going to be to that initial email that was sent prior to ticket creation, and is going to be a reply-all, and is going to result in additional tickets being created in ZD that require merging. If a simple email went out to the CC list upon creation saying "Hey a ticket was created that you're part of, please respond to this email only to add to it" then all external end-users would at least be aware they're dealing with a ticketing system and not just emails. We've had a number of escalations generated because of this exact behavior, with end users believing they're just part of an email chain and going back and forth generating large numbers of tickets that delay our response times. Ultimately it'd be great to see the CC list added as an option in the trigger/automation notifications actions, so we could simply customize it on our own if we wanted. Sorry, I don't work for Zendesk. I was reporting our issue and it seems someone else had a similar issue which was considered a bug. In any case, the way we have things set up, the creation of the confirmation reply from us isn't part of the ticket chain, so the CCs don't get that anyway - it's sent to the requester only. This wasn't any part of the fix that was implemented. That part behaves exactly the same way as before for us all that happens is they think we're sending them a duplicate of the email they've just got. And I'm pretty sure that in our case, a reply sent from a cc to the original mail is just added to the same ticket without any problem. Maybe there's something in the settings which controls this. But as I said, I don't work for Zendesk, so I can't really help. Sorry. I know, still wanted to put our workflow out here as I feel that the "fix" done last year has actually broken something that's pretty important. Our initial notifications are the same, they go to the requester only, as there isn't an option in the triggers or automations to notify the CC list (that's system level only). I wish there was, that'd make this a lot easier and more customizable. But we're running into situations where end users CC other end users when they email us, and because most end users don't realize we use Zendesk (not that we can expect them to anyways) that they don't realize a ticket exists, and people keep replying-all back and forth with new tickets being generated with different requesters. If we catch the initial ticket creation and put a public comment in immediately it's all good, but I can't even trigger a comment addition (which would be another work around) that would trick the system into sending out the CC notification. Sure. I understand your point, but I don't think the fix has changed anything except that they don't get a copy of the same email they just received. Did getting a copy really help people understand that they were in a ticket chain? Our experience was that they didn't see it as a threaded conversation, they only got annoyed and complained ("Why are you spamming us?"). But I think you might need to create a support ticket for the multiple tickets. As I said, when the CC replies in our environment, no second ticket is created. Their comment lands in the original ticket, and (I'm 99% sure of this) the notifications only go to the people not included in the email they sent - meaning still no duplication for the other email recipients. Not sure if this is the right thread but I had a ticket with one user (User1) and I merged another ticket with a different user (User2). User2 responded to their original email but it showed up as flagged in the User1 ticket. Did User1 see the email response from User2 or does that only show up for me as an agent? I would like to use a white list instead of black list, that I will be able to add as CC only emails that are white listed. @moshe - I like that idea!! The whitelist/blacklist settings are really designed to prevent email from coming in from undesired end-users. An alternative approach would be to disable the "Anybody can submit tickets" option (found by going to Admin>Settings>Customers), which will then make it so you have to add end-users directly yourself in to your Zendesk. Then, you can determine which users exist, thus also limiting the people that can be copied on a ticket. Obviously the drawback to this plan is that you are now limiting those who are able to submit tickets in to your Zendesk via email. This might be a good idea to put in the Product feedback forum as well! Is there a way to alert requestors that there are cc's on their ticket? Certain departments here use Zendesk as email, rather than one-off customer service interactions. It would save us client confusion and frustration if a cc notification for requestors existed, b/c more often than not, our requestors don't know that there are others on or still on the ticket thread. Zendesk's CC's act like BCC's and that is a dangerous thing sometimes. PLEASE HELP! Is there a way where CCed recipients can see who else is copied on an email? The problem we are having is that when an agent manually adds a CC the requester does not get informed or has no way of knowing who else is copied on the email. We would like to have visibility for both the agent and all those who are CCed. Can someone point me in the right direction to have this configured? I did not see an option under Settings. The only option for now is to add some special code to your notifications. If you want requester to see which other users are CC:d, you'd add that in your triggers that has your email notifications. If you want your CCs to see other people that are CC:d on the ticket, you'd add it to your CC template found in Settings>Tickets. You could do one or both, depending on what you want. Thank you for the link! That helped and along with the comments in that article i was able to configure my triggers and notification to display the CC. I do however have another question. When a CCed person responds using MS Outlook and selectively removes another CC or only wishes to respond to the requester, he/she is not able to do so without ZenDesk sending a copy to everyone who were copied on the ticket. ZenDesk will still send a copy of the email to everyone else who were originally CCed. Is there a way to get around this and allow the CC list to be modified by one of the recipients? The requester is sending an email to the ticket, not to the agent, and by default all end user comments are public. The ticket rules will notify the end users when a new public comment is added. So if you cut all CCs out of your email but include the ticket, they are still getting notified by the ticket. It's kind of like if you sent and email to a distribution group and also cc members of the group. If you cut one of the CCs out but leave the group in, they'll still get the email.